Description: Pamper her with a gift from the heart of France. 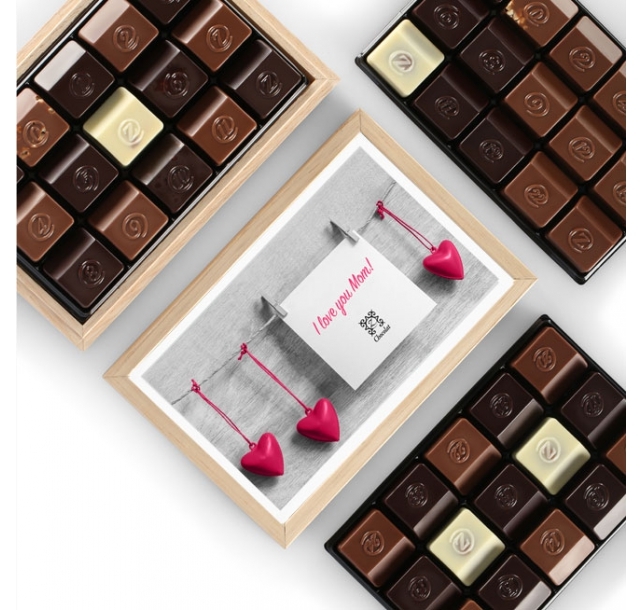 Our fifteen most requested recipes arrive nestled inside a genuine chestnut wood box topped with a "I Love You Mom" message. 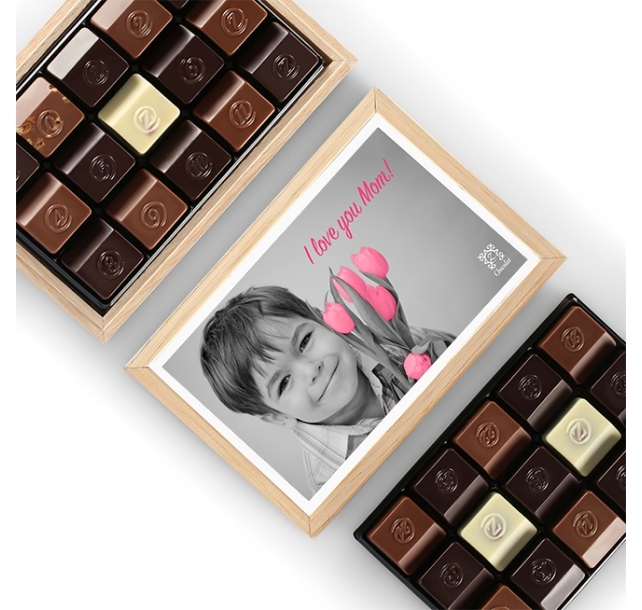 Featuring rich single-origin cocoas and innovative ingredients from around the globe, it’s a tasteful way to celebrate the million little ways mothers make the world go round. Description: She held your hand for a time, but will stay in your heart forever. Commemorate this powerful connection with the Mother’s Day 30. Bursting with both the traditional assortment and the exotic assortment, this natural biscuit-colored box is an elegant tribute to love remembered and a beautiful keepsake for future mementos. 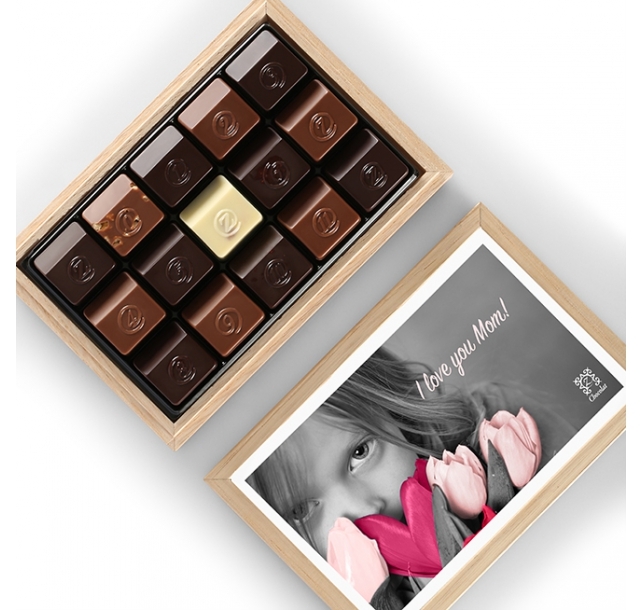 Description: The incomparable love of a mother-heart deserves the unparalleled indulgence of the world’s finest chocolates. Filled with 45 sumptuous chocolate creations from Master Chocolatier Pascal Caffet, it’s a well-deserved foray into the flavors of French chocolate and a delicious reminder that no one else compares to her. 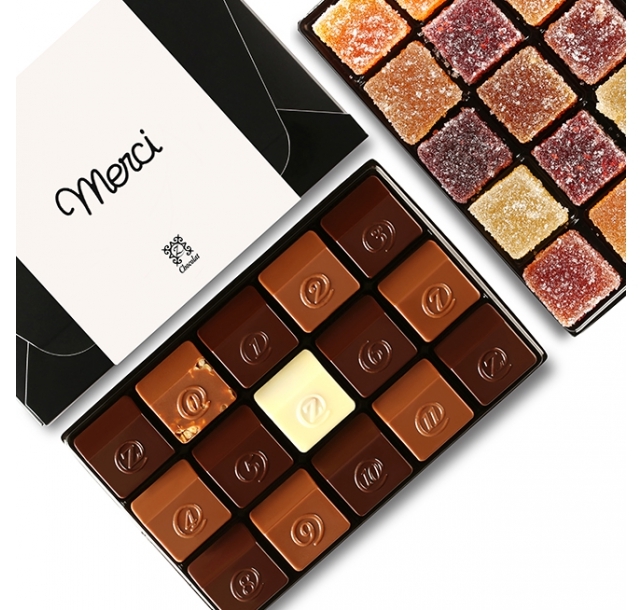 Description: This special edition product features a 15-piece traditional assortment comprised of our most requested gourmet chocolate recipes combined with a complementary 15-piece assortment of our sumptuous pâtes de fruits. Adorned with the simple expression “merci,” it’s a professional yet luxurious way to recognize the countless contributions made by administrative professionals throughout the year. 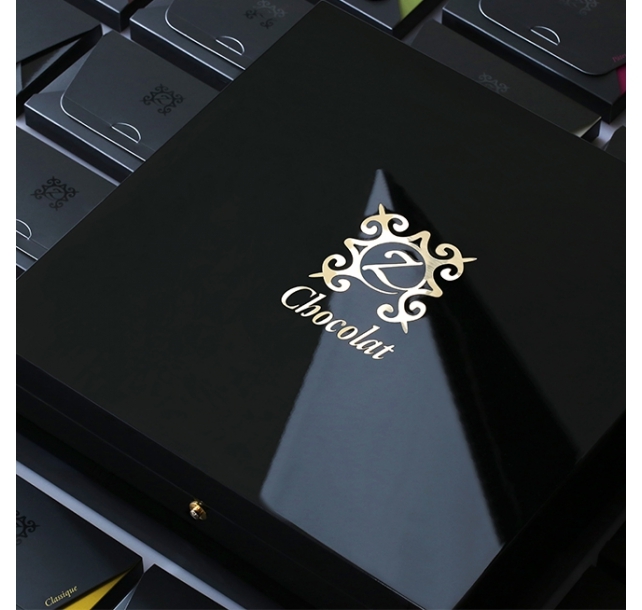 Description: Explore the vast empire of zChocolat creations in one exceptional selection. A gift of epic proportions, the Imperial features 28 individual assortment cartons arranged in a single decidedly sophisticated package. 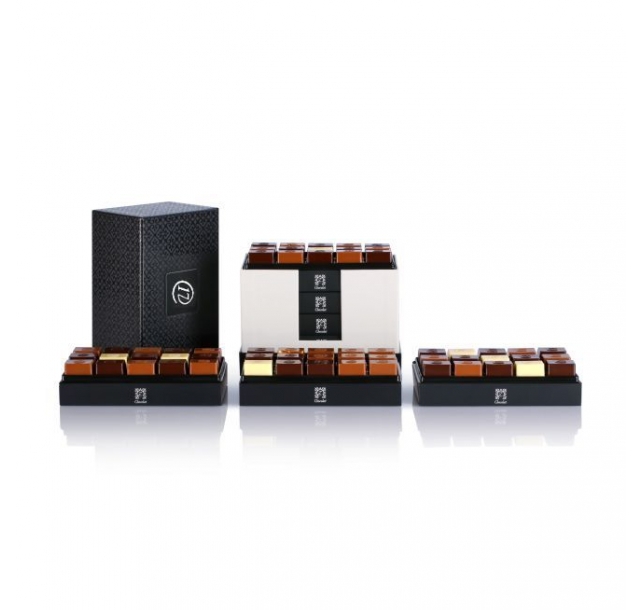 Stylishly chic, each lacquered wood box is the result of a painstaking twelve week production process that proudly complies with Europe’s stringent toxicity regulations and epitomizes zChocolat’s flair for modern culinary elegance. An ultra-refined way to experience the unabashedly delicious recipes that have made us the world’s favorite source for fine French chocolate. Description: Treat the entire team to something sweet this holiday with the Holiday Chameleon 45 box. A perfectly panoramic selection of 45 melt-in-your-mouth morsels presented together in a handcrafted chestnut wood box, it’s a sweet surprise guaranteed to help make the season merry and bright. Description: Unparalleled indulgence meets impeccable design in this luxurious assortment. 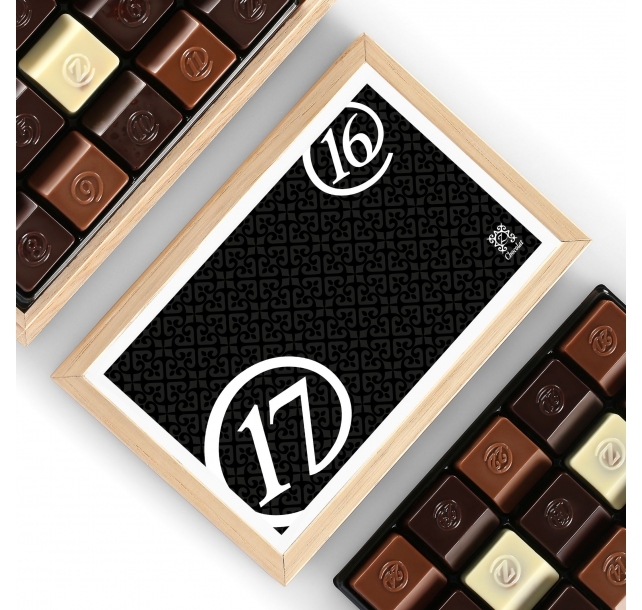 The zBox 60 includes a selection of our classic Z chocolates, the entire Numbered Collection, plus duplicates of our most-popular Numbered pralines. 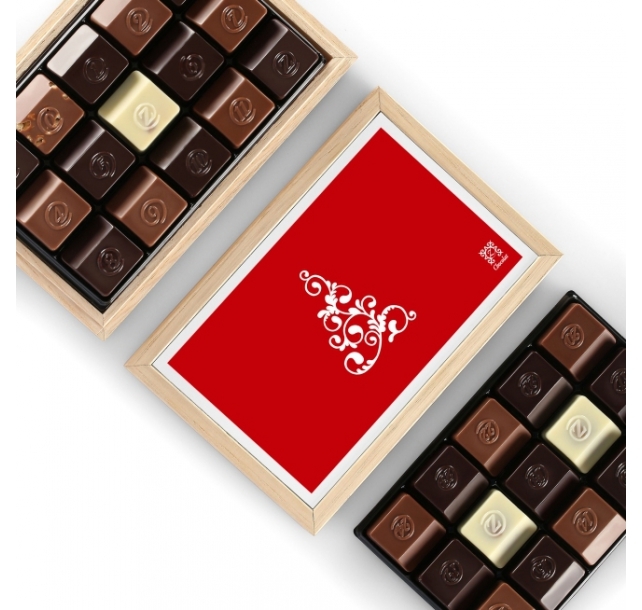 The sumptuous marriage of flavor and style, it’s sure to be a dream-come-true for the chocolate-lover in your life makes this ultra-elegant gourmet box a 'must-have' to celebrate the arrival of 2017. 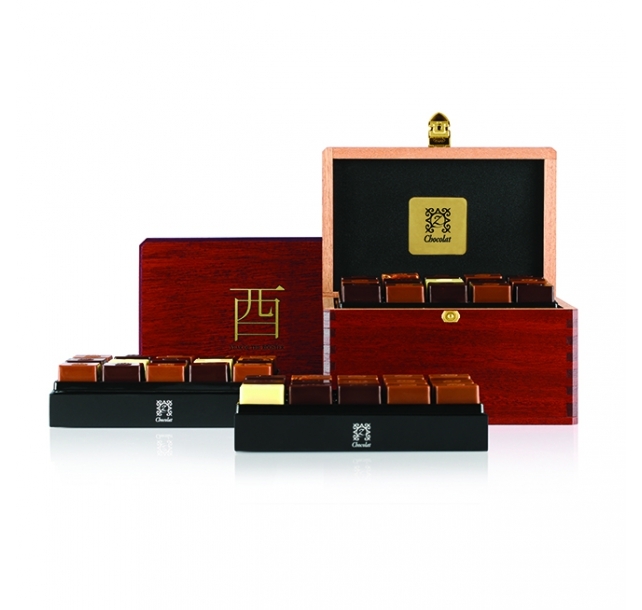 Description: Enjoy the entire numbered collection surrounded in the understated elegance of artisan-crafted chestnut wood. 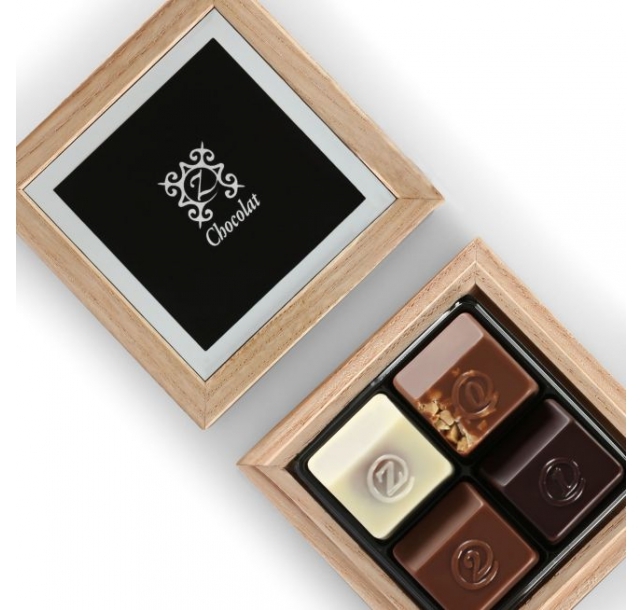 Featuring both traditional favorites and surprising new combinations created by Master Chocolatier Pascal Caffet, the Chameleon 30 box is a 'must have' to celebrate the arrival of 2017. Description: Always have something spectacular on-hand with these ready-to-go gift assortments. 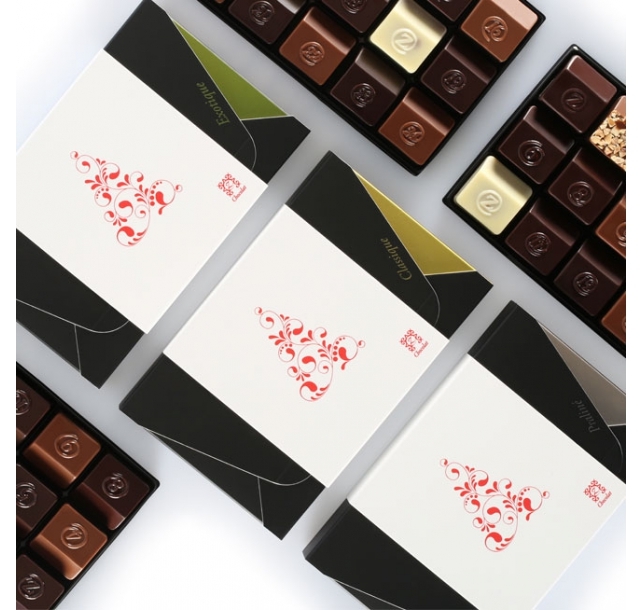 Our two favorite assortments (traditional and exotic) plus a complimentary praliné assortment have been separately packaged in elegant black pouches alongside beautifully photographed booklets describing the individual chocolates. Create a customized greeting card to include in all three and chic gifting is suddenly simple, even at the last minute. 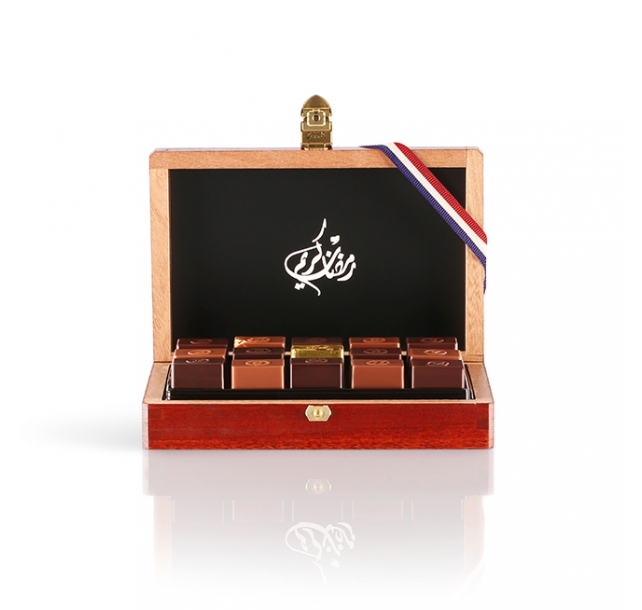 Description: This vibrant and sophisticated 2017 limited-edition polished mahogany box packed with 45 exquisite French chocolates handcrafted by World Champion French Chocolatier Pascal Caffet. A perfect present to celebrate the Year of the Rooster. Description: The Romantic Sapphire Gold 2 pc is a striking tribute to true love. 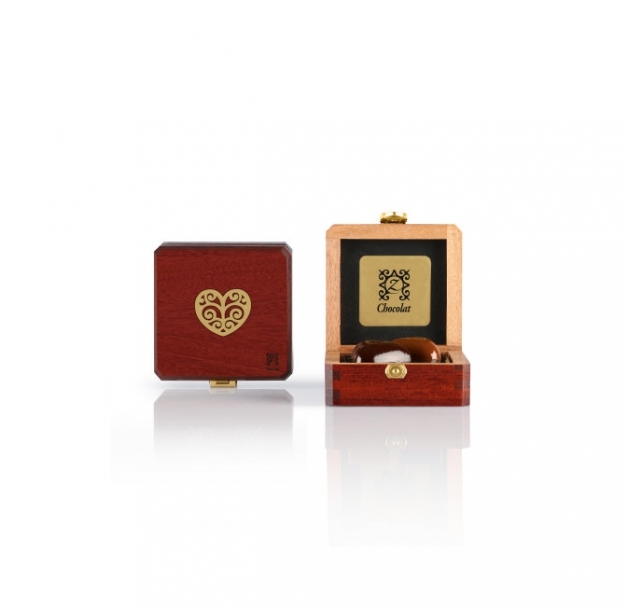 A shimmering pair of 24-karat gold leaf-covered heart-shaped chocolates are surrounded by ten of our incomparably decadent dark chocolate hearts, then packaged in an elegant mahogany box, for an instantly eye-catching gift that simultaneously entices and enchants. 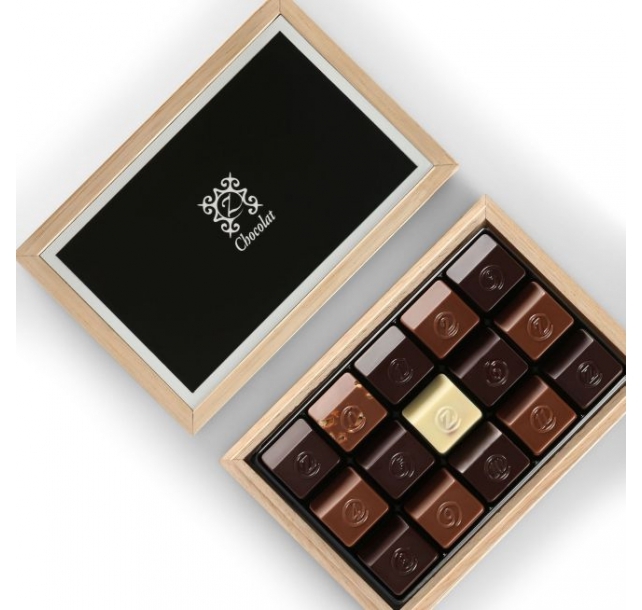 Description: One dozen of our seductively rich dark chocolate hearts have been filled with ‘fleur de sel’ caramel on the inside, and then gilded with 24-karate edible gold on the outside for a result that embraces romance with reckless abandon. 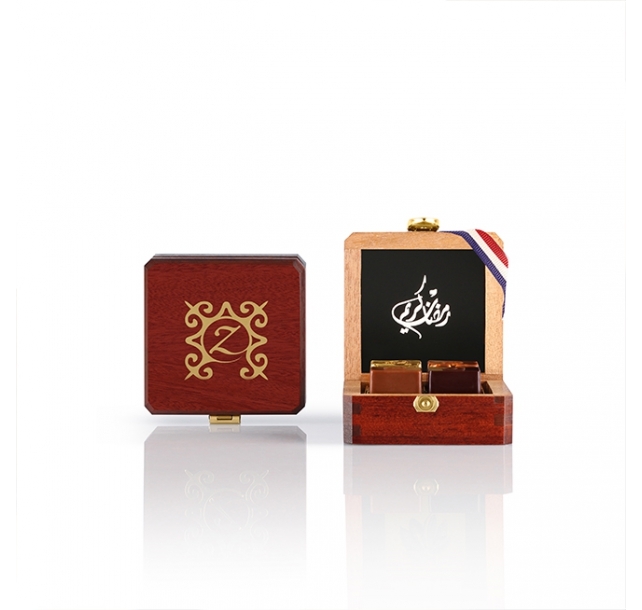 Tastefully packaged in a solid mahogany box featuring elegant gold filigree details, it’s a gift fit for your heart’s greatest treasure. 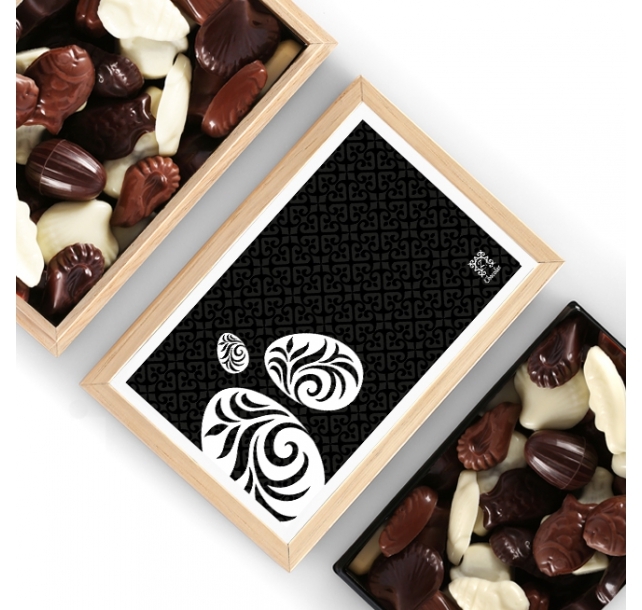 Description: The understated elegance of artisan-crafted chestnut wood meets the over-the-top excellence of our famous pralines in this artful springtime celebration. Enjoy 38 chocolates filled with finely ground, caramelized Piedmont hazelnuts, alongside 24 solid chocolates featuring our finest single-origin cocoas. It’s an Easter treat everyone will be racing to find first. Description: Give the warmth and joy of a French Christmas with the Holiday Chameleon 30 box. Brimming with every recipe from the Numbered Collection, the Holiday Chameleon 30 is presented in a naturally elegant chestnut wood box featuring a fresh holiday design sure to enchant anyone with a soft spot for the south of France. 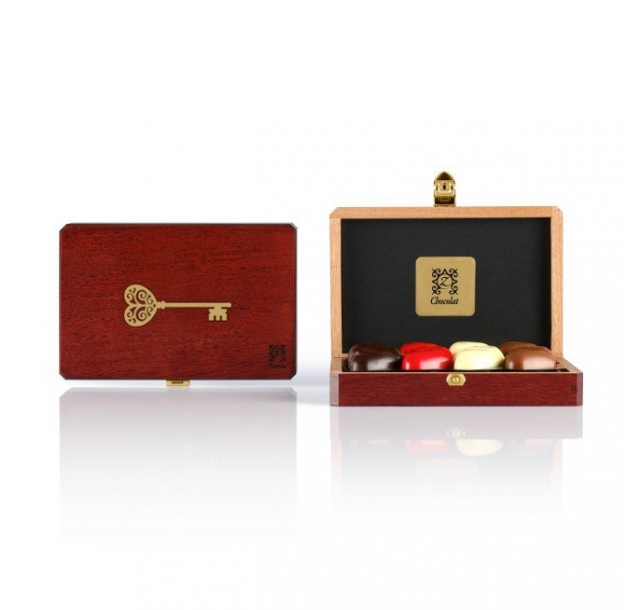 Description: Sample four of zChocolat’s famously sumptuous selections in a delightfully petite chestnut-wood package. Containing one each of the classic Z chocolate (a sweet-salty caramel plus crunchy praline), the much-loved chocolate number zero, (a slow-roasted hazelnut and almond praline), the intriguingly lovely chocolate number one, (a lavender-and-chocolate-infused vanilla ganache) and the perennially popular chocolate number two, (an enticing Italian gianduja praline), it’s a satisfying survey of the flavors that have made zChocolat the first choice for chocolate aficionados. Description: Mitered corners and frame-like details make the lid of each Chameleon 15 box the perfect place to showcase something special. 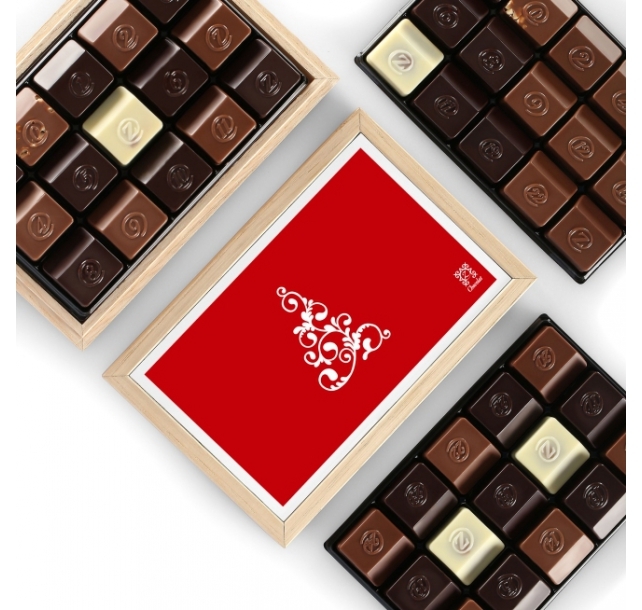 Customizable colors and the option to add laser engraving or personalized artwork translate into a truly unique packaging experience, while fifteen of our finest recipes make it a gift sure to gladden the heart of any gourmand.